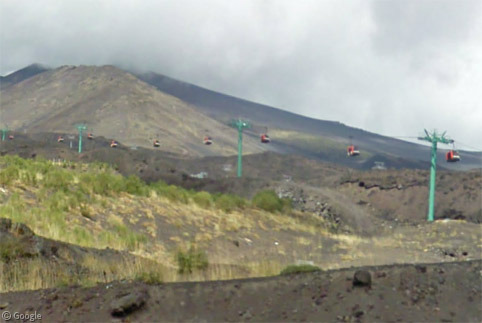 Siciliy’s Mount Etna is the largest volcano in Italy, the tallest in all of Europe, and one of the world’s most active volcanoes, with some form of volcanic activity taking place almost constantly. 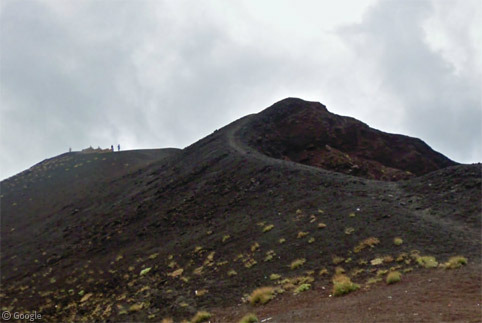 Mount Etna’s height varies with the ongoing activity (as I’m researching this post, Wikipedia gives two different numbers) but it is at least 3,300m (almost 11,000 feet). 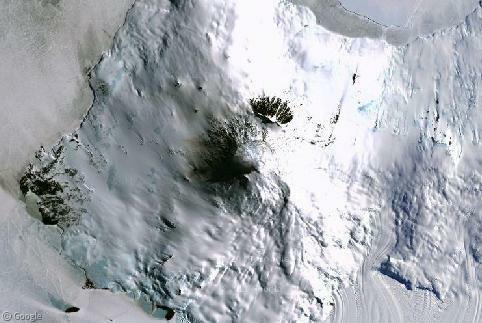 The summit has a number of craters, some of which are shown on Google’s satellite imagery with steam pouring out of them. Summit eruptions can be violent but generally don’t trouble residential areas of the island. 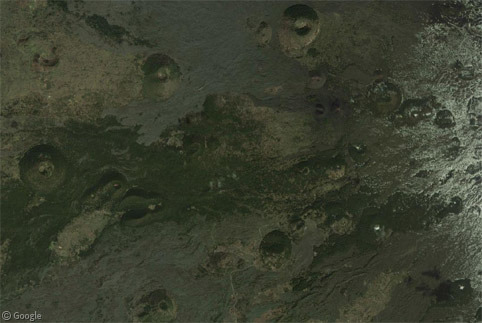 However, the flanks of the volcano have hundreds of vents and craters. 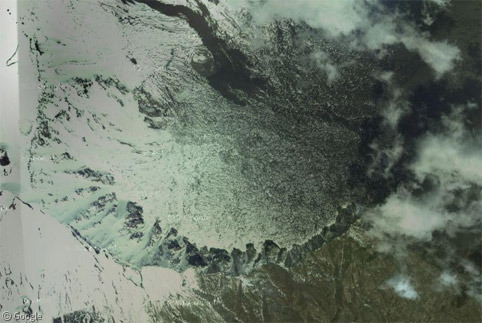 When eruptions happen lower down the mountain they can threaten populated areas. Thankfully, extensive damage is rare – a number of villages were destroyed by a major eruption in 1669, and in 1928 the town of Mascali was almost totally obliterated. It was subsequently rebuilt nearer the sea. 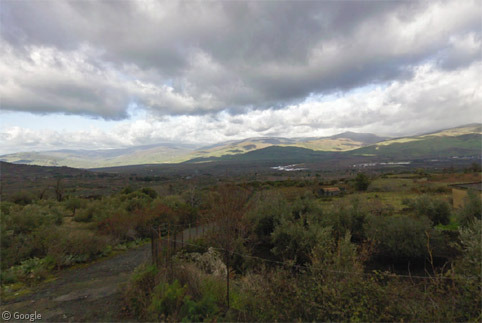 On the eastern flank, a large area of the volcano collapsed an estimated 8,000 years ago, creating a depression known as the Valley of the Ox. 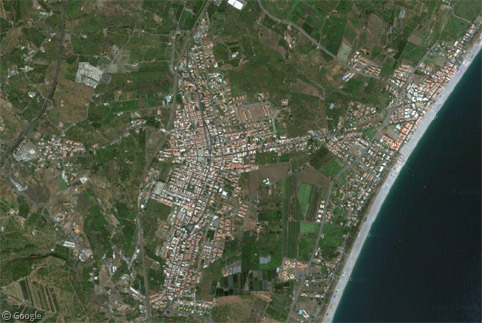 The resulting landslide is believed to have caused a massive tsunami in the Mediterranean Sea. In the last century, major eruptions occurred about once a decade, but as the extensive history in the Wikipedia entry shows, less serious eruptions happen all the time. 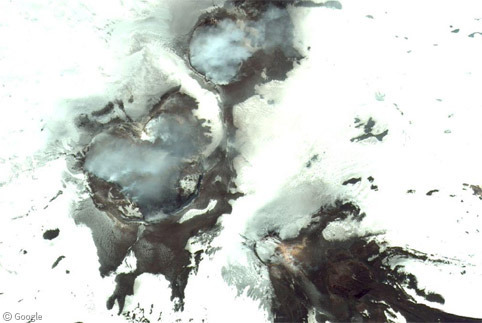 In 2011 alone there were more than 20 recorded volcanic events. The Telegraph has excellent video of eruptions earlier this year. 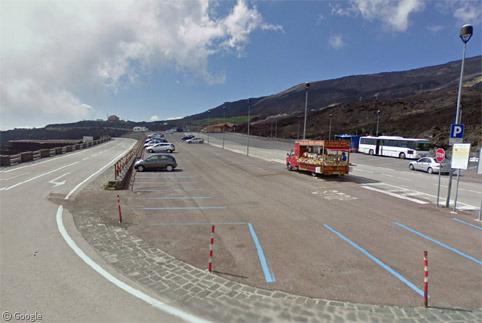 Given all this potentially dangerous activity, there’s a surprising amount of human presence on the mountain, with homes, bars, restaurants, shops and tourist facilities, and of course roads – some of which were visited by the Street View car. 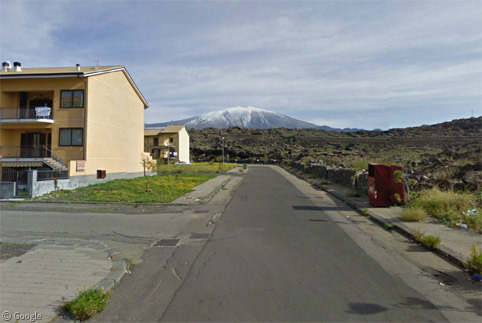 On the western flank we can see the barren mounds of volcanic material that are being removed and replaced by new developments of residential and industrial facilities, while the snow-capped peak looms in the distance as an ever-present reminder of what could happen again. 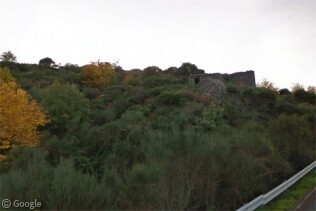 In areas on the lower slopes that haven’t seen activity in a while, vegetation has been re-established, leading to beautiful tree-lined roads, or low growth through which abandoned buildings can be seen. 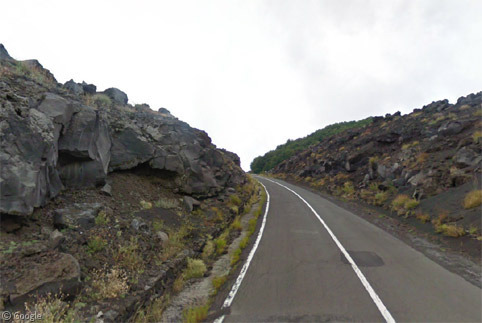 While in other areas, the road has had to be cut through deep mounds of volcanic material. 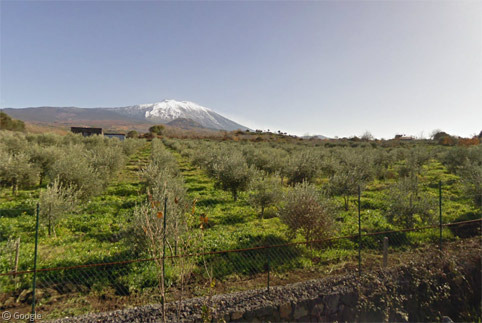 In other areas of lower volcanic activity there are extensive farms and fields of fruit trees, taking advantage of the fertile volcanic soil. 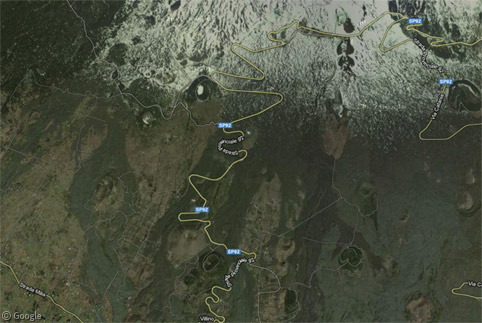 Most of the tourist activity is focused on the southern flank, with a couple of roads zig-zagging up the mountain with numerous hairpin bends. Along the way there are many small businesses willing to take your money. 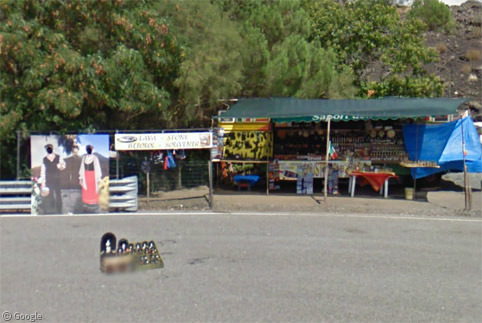 There’s a particularly odd set of offerings available at this place, including lava rock (presumably they’re hoping it’s too much effort for people to take one step off the road and simply pick up a free rock), a doll collection (mysteriously placed in the middle of the car park), and a cutout portrait frame (in case posing for a photo in front of an actual mound of lava is beyond you). Along the way there are scenic viewpoints, some of which allow us to see some of the lower cone-shaped vents. 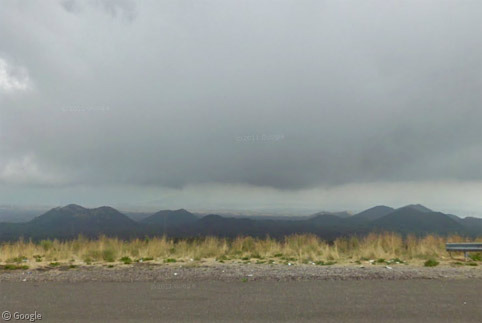 And on the day the Street View car drove one of the roads, this particular point was just about at cloud level. 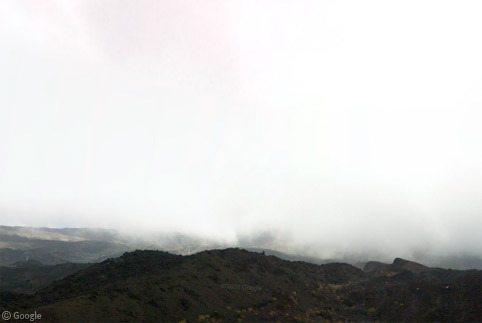 At the highest point reached by the road, our view of the summit is unfortunately mostly obscured by the clouds. 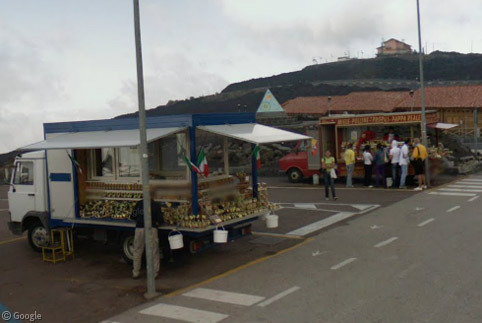 … and at least two hotels. 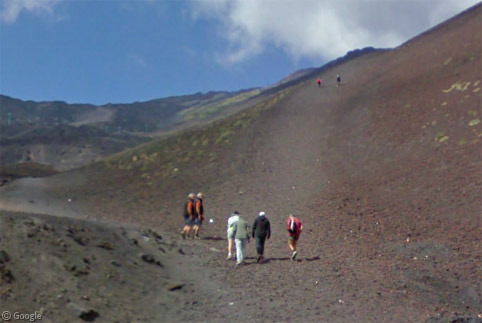 More adventurous visitors can take several paths across the lava to visit some of the vents and craters up close. 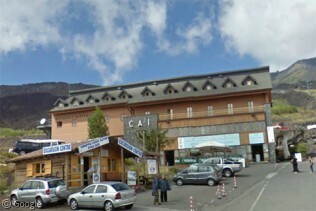 There’s also a cable car allowing visitors to reacher even further up the mountain, which is also used by skiers in the winter. This YouTube video has the full 11-minute ride. 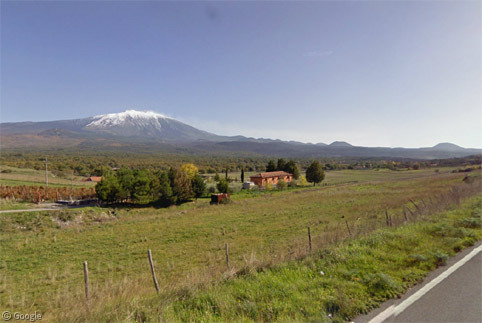 We’ll end with this spectacular view of Mount Etna’s snow-capped cone and several vents, under a cloudless sky, from a small road on the north-west flank. 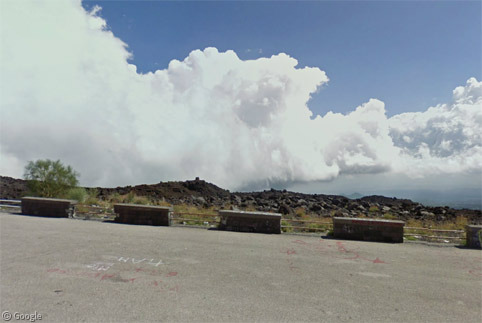 Found any more interesting places or spectacular views on Etna? We’d love to see them, so please do leave a comment with a link to anything you find.